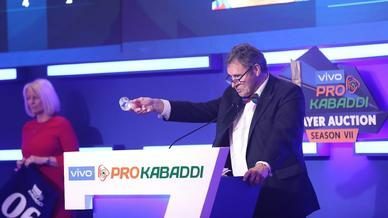 The final game in Delhi sees Dabang Delhi K.C. host Tamil Thalaivas at the Thyagaraj Sports Complex on Thursday. A victory in this Inter-Zone Challenge Week clash will see Dabang Delhi K.C. consolidate their position in the top three of Zone A as the race for the final Playoffs spot from the zone intensifies. Victory for Tamil Thalaivas will see them move above Telugu Titans into fourth place in Zone B. The only previous clash between these two teams ended with Dabang Delhi K.C. winning the encounter by a solitary point. 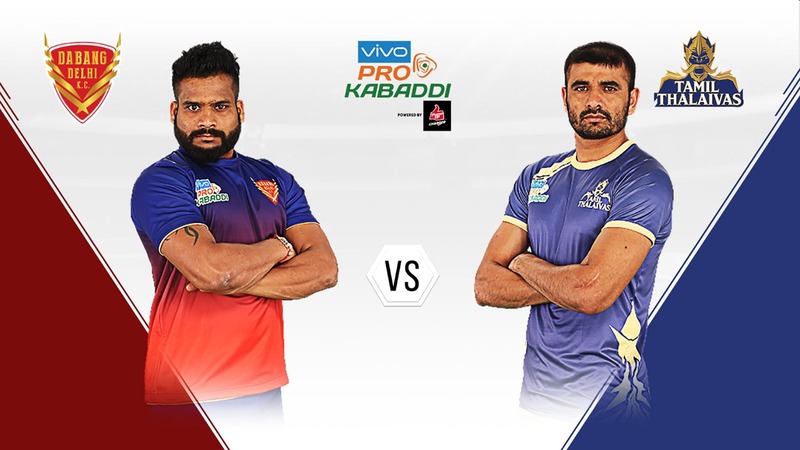 Meraj Sheykh and Ajay Thakur starred for their respective sides in that match and will be looking to make an impact again. Dabang Delhi K.C. 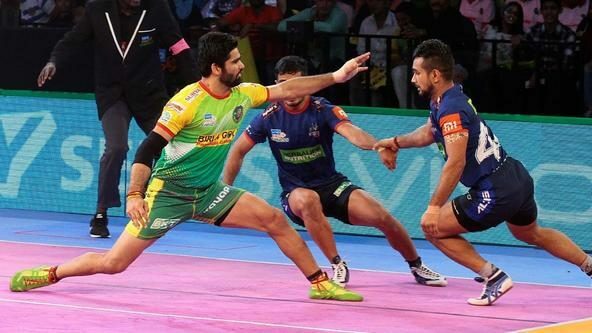 captain Joginder Narwal has led the team successfully this campaign as they chase a first-ever VIVO Pro Kabaddi Playoffs spot. Narwal has 43 tackle points in 18 games so far and, while he ranks tenth on the overall list of Best Defenders, he ranks second amongst his team for tackles assisted. Narwal’s role will be even more important given that his team will be up against a raider who can singlehandedly turn games around - Ajay Thakur. Thakur sits fourth on the list of Best Raiders for this season with 154 raid points in 16 outings. His form has been of utmost importance for the side as he sits 112 raid points clear of their next best raider. Thakur averages 9.63 raid points per match and his side will look to him for another big performance as they continue to fight for a Playoffs spot. 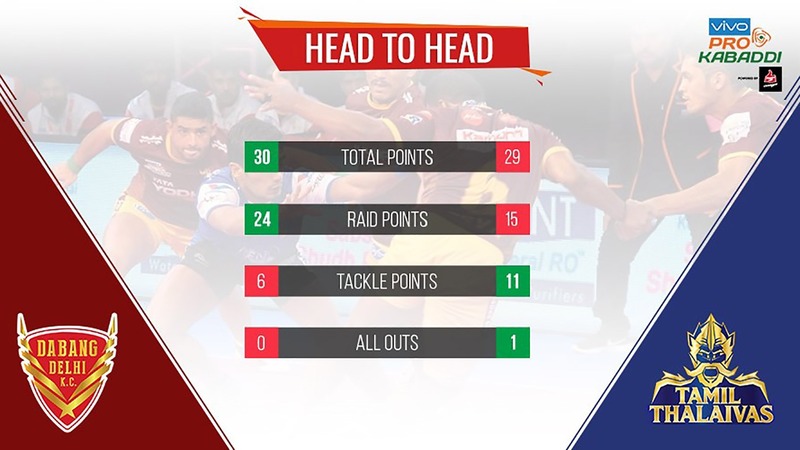 Thakur leads the duo’s head-to-head battles 4-1 but Narwal’s team has momentum on their side in their home leg which makes the contest between the Right Raider and Left Corner very interesting. 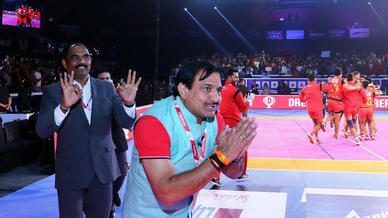 Naveen Kumar – Dabang Delhi K.C. 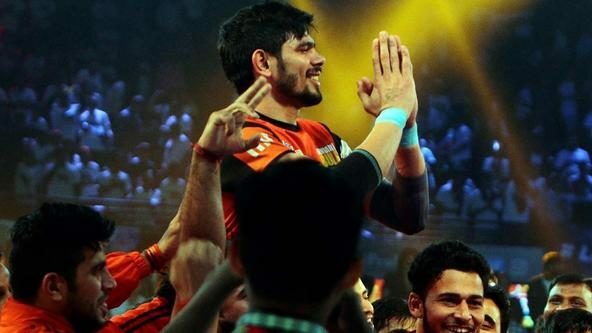 Naveen Kumar has been an important cog in Dabang Delhi K.C.’s wheel in his rookie season. Entrusted with the responsibility of being their lead raider in his debut season, he has scored 137 points in 18 games. Four of Kumar’s six Super 10s have resulted in victory for his side. This shows how important the youngster is for Dabang Delhi K.C. Manjeet Chhillar is one of only six players this season to manage 50 or more tackle points. The veteran sits fourth on the list of Best Defenders, having returned with 56 points from 16 games. His form has been vital for the side all through the season and Tamil Thalaivas will look to their talisman to deliver another huge performance.